With six La Ligas, seven Copa del Reys and four different European trophies, Valencia Club de Fútbol stands tall as one of the most successful football clubs in Spain. They're also the third most popular club, right behind the untouchable Real Madrid and Barcelona, with over 50,000 season ticket holders. The club's excellent reputation is helped by its youth academy, which is regarded as one of the world's best breeding grounds for young talent. Even though the club was founded in 1919, it only moved into the world-famous Mestalla stadium in 1923. The first couple of decades of the club's existence were not particularly fruitful, but things started to change after the Spanish Civil War had ended. 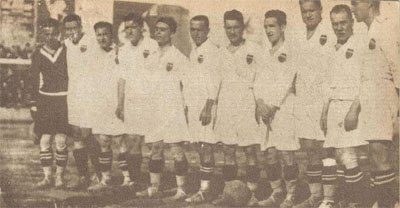 The post-war period saw Valencia acquire taste for silverware, winning its first La Liga titles in 1942, 1944 and 1947 and two Copa del Rey trophies in 1941 and 1948. While the club had seen some cup success in the next two decades, they had to wait for Alfredo Di Stéfano to arrive at the club in order to win their fourth La Liga title. It came in 1970, the very first year of Di Stéfano's tenure as manager. The famous Argentine player and coach also led the team to its first and only Cup Winners' Cup title in 1980, in his second term with the club. Valencia's glory days came at the turn of the millennium. First, however, they had to shake off their losing mentality; the club lost two successive Champions League finals, to Real Madrid in 2000 and Bayern Munich in 2001. The latter season also saw them slip to fifth place in La Liga after spending most of the season at the top of the table. The next four years more than made up for their woes, as Valencia won two La Ligas in 2002 and 2004 and a UEFA Cup in 2004. Not long after that, due to the rising financial troubles, the club had to start selling its best players in order to reduce their debts (also the building of the new stadium Nou Mestalla was came to a standstill due to the financial struggles). Even while teetering dangerously close to the relegation zone, however, Valencia managed to win its seventh Copa del Rey trophy in 2008. 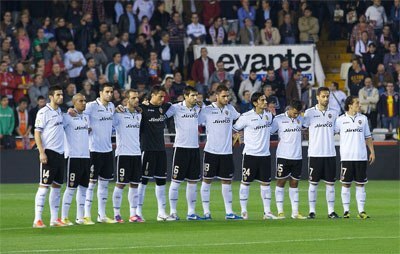 Team line up in 2012. This club has without a doubt a logo that stands out. Instead for the more typical crown over the shield, a bat is used. The bat was added to the logo in 1921 and since then there has only been minor modifications concerning the design.